Keenspot • View topic - AHAHAHAHA! And if you wait for after the credits there's an extra scene of me with no pants on. It's worth it. The movie event of the year! wouldnt a bigger shock be showing a scene with your pants on? Yarnie would look hot in a skirt. I was actually thinking of a nice, slim, simple black full-lenth skirt. And a light blue t-shirt. SPeaking of boys in women's clothing, I've got a great shot of one of my mates in a pink dress. Well, actually we have several shots of him in it... he's worn it on many occaisions. 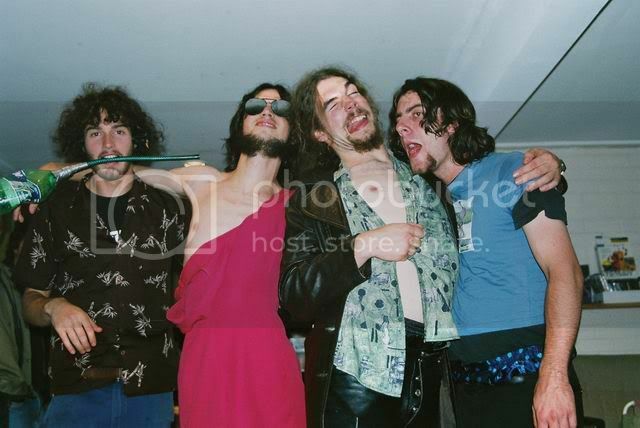 But still... best band photo evar! I'd say that's hot, but I don't know how young this friend of yours is, so I'll just say it's awesome. No, not a light blue shirt. Something more vibrant. Khris wrote: I was actually thinking of a nice, slim, simple black full-lenth skirt. And a light blue t-shirt. You want to buy them for me, I will wear them and take pictures for you. I'll give them to you when we meet halfway from Winnipeg to Mesa. Khris wrote: I'd say that's hot, but I don't know how young this friend of yours is, so I'll just say it's awesome. Man, I wish my guy friends were willing to do that. It was better seeing him doing it on one of the last days of school. Man, some of the looks he got... classic. I'd imagine that's the main reason he does it. Unless he likes the way the wind blows upwards. Khris wrote: I'll give them to you when we meet halfway from Winnipeg to Mesa. PSY- WOW! Awesome picture man, I laughed. Khris wrote: I'd imagine that's the main reason he does it. Well, the last week had different dress-up themes for each day. I can't remember what the theme was, but he *did* have valid reasoning behind the dress. Funny stuff. Oh man, I got a FedEx call from a lady in Mesa. IT COULD HAVE BEEN YOUR MOM! And Psy - I have to say that's quite hot. If it was, it'd be weird, because I don't live with my mother. She doesn't even live here in Mesa. She lives in Yuma, a smaller city south of here. So if it was her, then I am going to have some questions to ask. PS- If we were to call would we just have to take the chance of it being you or can we say something like 'oh you guys have screwed up one of my packages before, I want to talk to Monica, she took care of me last time" ? Pretty much up to chance. And probability states that it isn't very likely you'll get me. The call centre I work at has like 700 FedEx employees. And there are like a billion more call centres. And you have to call from within the US. Sorry Chris. I mean, FCL. Maybe I should try like, once a day or something? Can I make up a fake package thing? What should I do. I have come across a problem with my Package. I can't open it. I think the zipper is busted. Perhaps i need to erect it first? What do you suggest?